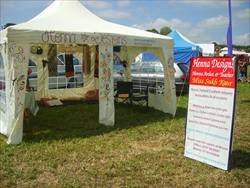 Holistic Henna value years of experience in and around the South West supporting and participating in a range of cultural diversity and charity events to say the least. Our professional reputation accounts for working with Public Liability Insurance, CRB checks, Risk Assessments and qualifications in Teaching. A member of the Asian Arts Agency and networks within South Gloucestershire and Bristol City Council. Whatever the occasion, please get in touch using our contact form here. We have a set hourly rate however appreciate some organisations work within a limited budget therefore try our best to accommodate those. Activity sessions and workshops should be pre-booked with an agreed service amount unless otherwise discussed. 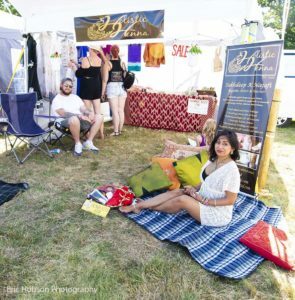 Our set up includes an authentic Indian backdrop of gold and orange raw silk materials, comfort cushioning for those being henna’d to feel relaxed. Incense or oil burner (optional) to set the mood. Complementary glitter to add glitz to the designs’ quality finish. Plus, a pre-printed appointment sheet made for those wishing to book a slot within the activity time. There is always a design portfolio on hand for clients who wish to choose or draw inspiration from. Additionally, one can most certainly trust our holistic approach to create an individual piece of art which in turn, maximises on our speed of flow. 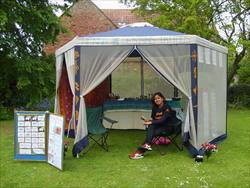 ‘As Chair to “Friends of Kingswood Park” it has been my pleasure to book Henna Designs (formerly known as) for events held locally. Sukhdeep has first class communications, reliable and excellent time keeping. The art work has given pleasure to children and grown ups alike. I work alongside South Glos. City Council and Henna Designs are always top of our list to ensure that our events offer tattoo designs a pleasure to see and enjoy. Look forward to the next family fun day at the Park’.